Hello world! I've been in a bit of a turkey coma this week, but wanted to drop in to share one of my Thanksgiving successes: Vegan Dressing with Apples and Brown Rice. The recipe looks a lot busier typed up than it seemed while I was making it. I've been making a similar recipe for years, but only this year decided to add the rice and quinoa for a change in texture. There's something visually comforting about the purple-ish red onions, cranberries, and quinoa with the fresh green of the celery. The rice/quinoa combo also makes for a fabulous texture that sets it apart from any other mushy potato-championed dressing. For the record, this stuffing held its own alongside a non-vegan stuffing that was made with bacon. In fact, I ended up preferring this one for its texture. Whodathunk? In a small pot, boil the potato until cooked. Drain, mash roughly, and set aside to cool. In a large pan, heat the oil. Brown the onion, celery, garlic and sage. Remove from pan and set aside to cool. In the same pan, add rice, quinoa and vegetable broth. Stir and bring to a boil, scraping any remaining vegetables from the pan. Simmer until rice is tender. Set aside to cool. Combine cornstarch and apple juice in a cup or bowl. In a large bowl, add potatoes, onion mixture and rice. 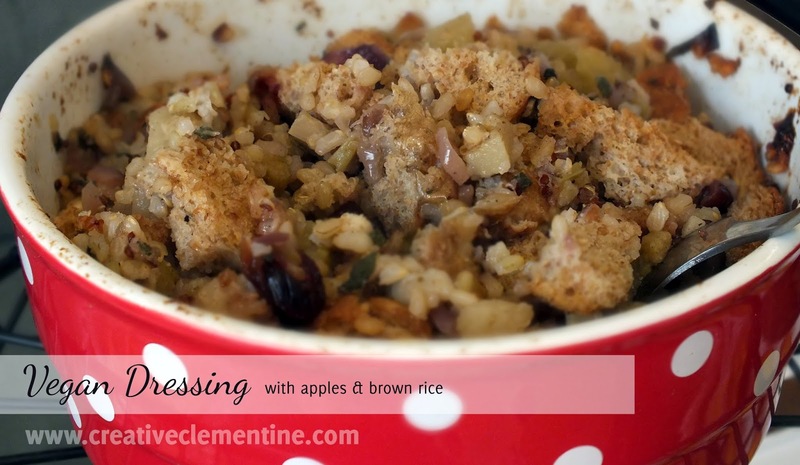 Gently toss in apples, cranberries, cornstarch mixture and bread if using. Add salt and pepper as desired. Press into a baking dish and drizzle with apple juice mixture. Cover and bake in a preheated oven at 350 F for 40 minutes.